Or simply switch your feet & sail clew first until you build up speed, then flip. Yes. That sounds like the Foolproof never fails gibe. Done in high wind, low wind, high speed or schlogging speed. It's very simple. over sheeting worx in the age of railroad tie narrow boards, race sails and aruba schmokin over powered conditions. i only over sheet now in very limited app's. namely, when jibing down a monster offshore swell that's been grabbed by a sandbar that jacks them up to make "the wall" look like a baby pool. hi, 7-8 foot swell, how did you nearly double? then i over sheet my 4.7 or 4.0 and ride straight down the wave face, flip the sail somewhere near the bottom, and sail back toward shore. unfortunately, that only happens a few dayz a year. over sheeting worx in the age of railroad tie narrow boards, race sails and aruba schmokin over powered conditions. I think it's useful to distinguish between full blown racing oversheeting that you're describing (where the clew is sheeted in so far that the sail is essentially luffing clew first, the goal of which is to dump power) and the less dramatic additional sheeting by the back hand as the front hand extends forward into the bow and arrow or pool shooting position while entering the carve, the goal of which is to aid acceleration into the turn. Nevertheless, the oversheet discussion was key for me. In non-planing jibes, I was able to control the pull by modulating the oversheeting. Too much pull when it's time to switch feet? Just pull a bit more on the back arm. I never felt so much in control, even while tacking. 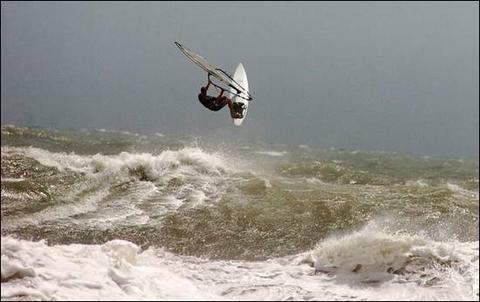 I would then open a bit to increase power clew first, gain a bit of speed and stability before flipping the sail. I don't think modulation can be done while doing a fully carved jibe, but I now have a feeling for what should happen with the sail now. Next step will be to get the weight transfert and feet switch right! That's great - thanks for posting your experience, Sailboarder! I think you're right in that it's hard to modulate the radius of a planing jibe in mid-turn without losing speed and the consistency of the arc. Much of it is planning and execution, visualization, perhaps rhythm - to place the perfect jibe into the space afforded to you between troughs or in the space to the jibe marker on the slalom course. I do know that I wobbled out of many race jibes when the guy in front of me splashed or stalled and I had to tighten the radius to avoid running over Pete (oops, no naming names....), and it's never as good, fluid and fast as a jibe that is consistent from beginning to the end. It's kind of like knowing exactly how fast you can take a corner with your car and then having to break for that cat in mid-turn. I see videos of these PWA slalom guys who, unlike myself, actually know how to sail, and they have the same issues when unexpected things happen at the marker. My jibe tips explain that only after I learned to dynamically modulate my carve did my jibes start to click. That applies to and very much includes slashing while sailing back and forth and would include freestyle ... anything that increases our dynamic abilities. The same goes for sheeting modulation. Both produce and indicate better familiarity with and mastery of rig and board handling so useful in something as complicated as learning the planing jibe. If we can't yet jibe in a wavy arc with inconsistent power, even textbook-condition jibes may suffer; mine surely did. mostly powered by the swell, rather than inertia. My jibe tips explain that only after I learned to dynamically modulate my carve did my jibes start to click. (snip)The same goes for sheeting modulation. This is not how to learn how to plane through a jibe. It's what Peter Hart refers to as "dabbing" and everyone else as lack of commitment. You lose speed and add board bounce doing this, ending up with a nonplaning finish. While it's true that as a jiber advances it is possible to make subtle tweaks to board and sail during the carve to plane through, the learning jiber is infinitely better off making smooth, committed movements.